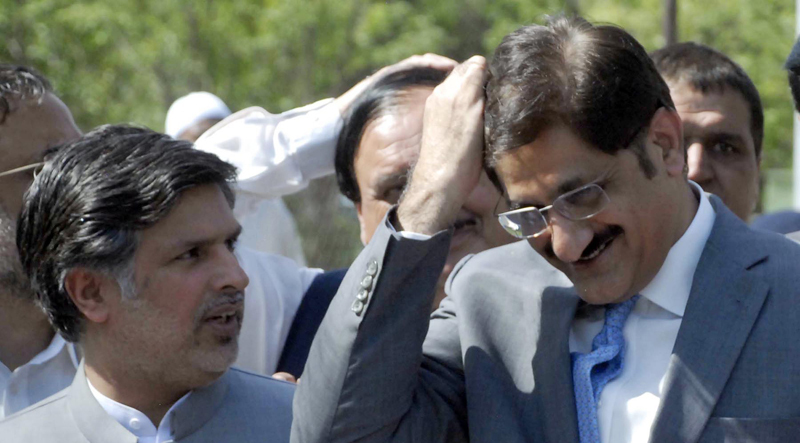 Sindh Chief Minister Syed Murad Ali Shah Monday appeared before the National Accountability Bureau (NAB) to record his statement in the fake bank accounts case. The combined investigation team (CIT) headed by DG NAB Rawalpindi Irfan Mangi grilled Shah for about one-and-a-half hour with regard to Thatta Sugar Mills and asked him to file a reply to the questionnaire handed over to him within two weeks. Pakistan People’s Party (PPP) leaders Nayyer Bukhari, Qamar Zaman Kaira and Mustafa Nawaz Khokhar accompanied the chief minister. Shah was scheduled to appear before NAB on March 26, however he requested to appear before the bureau on March 25. Talking to media after the interrogation, Shah said the NAB officials questioned him about Thatta Sugar Mills and that he responded to all the queries. He maintained that it would have been better if the anti-graft watchdog had summoned him in Sindh instead of Rawalpindi. He said he has assured NAB of his cooperation in the investigation and has no plans of filing a reference against the anti-corruption body’s chairman. He continued that he is being investigated by the bureau despite the Supreme Court’s orders of removing his name from the JIT report. He said NAB told him that they are investigating him on the top court’s orders. “My media trial is being conducted,” Shah said. “I came here today on my personal expenses and hundreds of guards were deployed here, however, had I been asked to appear in Karachi I would have appeared quietly. The case is being heard in Rawalpindi and none of our experiences in Rawalpindi have been good,” he said. Meanwhile, Omni Group on Monday approached the Islamabad High Court (IHC) seeking details of cases and arrests in connection with the mega money laundering case. The group has also asked about the nature of cases filed under the money laundering charges. It is to be mentioned here that the Federal Investigation Agency (FIA) had detained Namar Majeed – son of Omni Group Chairman Anwar Majeed – from the premises of Supreme Court’s Karachi registry.